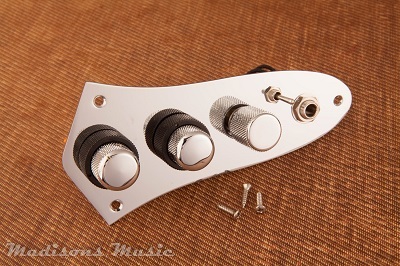 Madison's designed this harness to unlock the true potential of your guitar. This is a passive unit -no battery- and will work with any passive pickup. The controls offers independent Volume and Tone controls for both pickups. This allows you to blend both volumes and tones at any rate together. The third knob is a center detent boost. 1-5 is a treble boost (eliminates compression) 5-10 is a bass boost. The mini toggle switch is used to invert the phasing of the pickups. Overall we wanted to design the ultimate Jazz bass harness bass players can use.